Before Roz became a single parent about 10 years ago, she worked at a law firm in the field of bankruptcy, a job she found fascinating. However, it was very demanding and stressful and she made the decision to leave the law in order to raise her son. In our interview she was very clear about that decision and has no regrets. 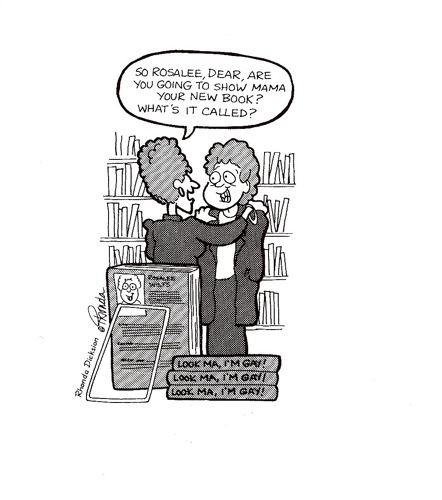 All her life Rosalind has been a reader (“bookish” is the word she used) and also a “goofy” person (her words again), so when I told he about my menupause website and my divorce blog, she told me about her humor books that she anthologized on women’s issues. My curiosity was piqued and a few weeks later she left me some of her books to review. I read them and smiled, giggled, and laughed at all the wonderful quotes, jokes, and cartoons about women in various stages in their lives. Rosalind told me she has always loved humor and has been writing forever. Many of her short fiction stories can be found in collections. Her anthologies were published by Crossing Press, a small feminist publisher that I know from reviewing a couple of their books, such as Women of the 14th Moon. Warren paid each writer or artists in her anthologies from her advances (monies given to the author before publication) or royalties. While most contributors often receive only free copies, Roz thought payment was in order. I find that admirable! From our conversation and Rosalind’s explanation, I realize now that women’s humor has long been in the closet, either because publishers thought that women weren’t funny or because they were threatened by their biting humor. The publishing of these anthologies, so cleverly collected by Rosalind, has given female artists/writers of humor an open window to share their work with others. I was impressed by this fact, because I had not thought much about it before In other words, Warren has provided a market for these women where there was none before. Good for her! While the books are no longer in print, they are still available through the Internet and directly from Rosalind Warren. Her website is: www.rosalindwarren.com. Below is a list of the books that Rosalind gave me as gifts and for review. I have included at least one joke or quote from each book. 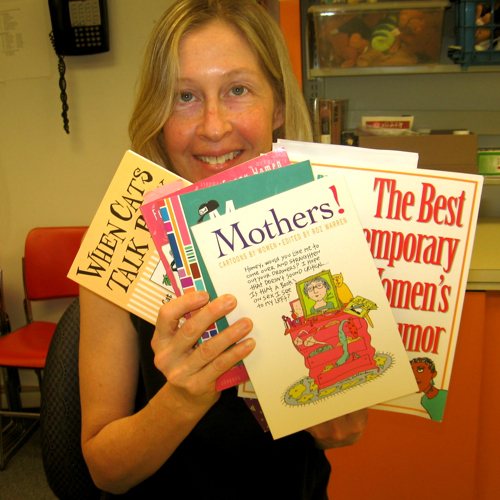 I love these books and recommend any one of them to tickle your female funny bone! Quote from Diane Jordan: Before accepting a marriage proposal, take a good look at his father. If he is still handsome, witty, and has all his teeth…marry him instead. There are two kinds of cat fur: Dark fur that sheds on light fabric, and light fur that sheds on dark fabric. quote repair: Study the divan if you want to patch the furniture. quote repair: You’ll catch hell if you bare your skin. This entry was posted on Sunday, April 18th, 2010 at 10:51 am	and is filed under Reviews. You can follow any responses to this entry through the RSS 2.0 feed. You can skip to the end and leave a response. Pinging is currently not allowed. Clever! To think man thought women had no sense of humor? Yes, all her books are funny!